Case in point being Tanzania’s burgeoning population which according to the National Bureau of Statistics stands at 54 million people. The business environment has, in the space of a decade, transformed rapidly and created an ecosystem for small businesses to not only grow but thrive, yet in the age of tech and open-source information, a large number of small businesses still fail within the first few years of operation. In order for a business to succeed, it needs to constantly adapt alongside the evolving market dynamics, doubling down on the aspects that work and eliminating the ones that don’t. Goals are the starting point of any success story, having a clear view of where you want your business to head in the next 6 months, 1-year and even 10 years. Having a long-term vision allows you to track the performance of your business. Entry-level business studies teach us to create SMART goals. All future plans must be Specific, Measurable, Achievable, Relevant, and Time bound. One practice that will ensure that your business operation remains smart is regular financial audits. Annual audits are an excellent way for your business to gain more control over its financial situation and they also ensure that your statements are accurate with no discrepancies. SME owners have a wide range of responsibilities as they play multiple roles in their enterprises and many find the notion of securing funding as a daunting task. Business owners are also often discouraged due to the misconception of having to undergo complex application procedures and submitting numerous documentations. One can navigate the maze of financing by finding a bank with advisory services for small businesses and banking products that specifically cater for SMEs. In addition, creating a banking history is a key component of loan eligibility. The statement of cash flow is a key financial statement when securing a loan. As a business owner, you need to be proactive in depositing sales into your bank account ensuring that all your business financial transactions reflect in your bank account and they all tally in the financial statements. Mobile bank applications make this all easy and convenient for daily use. Short- and long-term funding will rely on the relationship and history one has built with the bank; being creditworthy is a valuable asset for all SME owners. An important aspect that differentiates a large corporation from an SME is their recordkeeping. In particular, a thorough and comprehensive examination of your companies’ financial records by an independent auditor will showcase the accuracy of your financial statements when trying to secure funding. As a growing business there are plenty of advantages to obtaining a loan. It becomes imperative for you to plan for your loan requests well in advance as there are such factors as property evaluation, confirmation of deed transfers with the ministry as well as legal items that have to be factored in before you approach the bank for funding. Mapping out all the required legal documentation prior to applying for the loan will infinitely simplify the process and save you time. Assess your business and the industry it is in. There is abundant information online to help you distinguish how similar businesses have grown and succeeded. Seek advice from experts on how to scale up business operations. Advisory services are an important aspect for SMEs to unlock the potential their business may have beyond borders and with new supply chains. 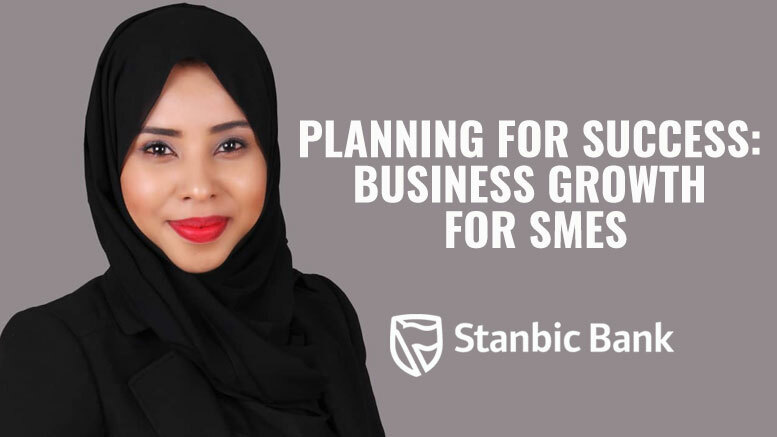 These advisory services can be found in banks like Stanbic Tanzania through their Biashara Direct offer that is tailored to SMEs and connects business owners to financial advisors who assist in realistically visualizing and planning for growth. Survivalists are in business purely as a means of short-term economic gain and in order for a business to grow, owners must transcend this mindset. SMEs start as micro enterprises to gain income but if you do not create long-term wealth in your operations, your business will operate on survival mode. SMEs of today are the corporations of tomorrow and with a growth mindset that prioritizes long-term success, this can be accomplished. A practical way to exercise this for small businesses is to make use of digital channels to bank and transfer daily revenue to save for the future.